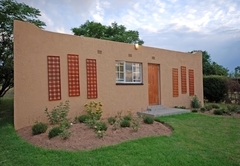 Hoopoe Haven Guest House is a 3 star graded guest house with self catering option, offering Chartwell accommodation for tourists and visitors of Johannesburg. 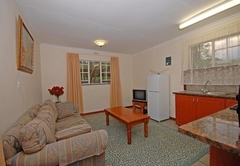 Hoopoe Haven Guest House offers affordable accommodation near Fourways. 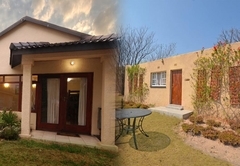 The Peaceful Guest House is situated in beautiful Chartwell, but it is just a stone’s throw away from Montecasino, Lion Park, 3 shopping malls, Lanseria Airport, live theatre and nearby Cradle of Humankind, Lesedi Cultural Village just to name a few highlights. 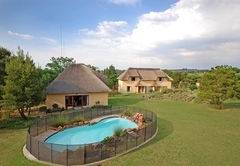 It is positioned on two acres of landscaped gardens in the countryside with horse trails around and a beautiful view of the Magaliesberg Mountains. 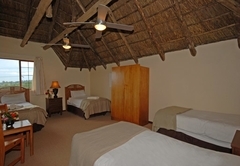 Guests can enjoy tranquility and a freindly atmosphere with quality accommodation. 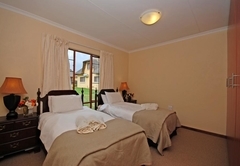 We have bed and breakfast rooms, luxury self catering cottages, pet friendly cottages and rooms, family tents, budget self catering cottages and group accommodation. 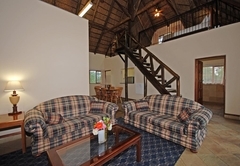 Come and enjoy this home away from home whee you are not restricted at the guest lodge and have your own access keys so you can come and go as you please. 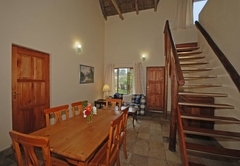 A very large 2 bedroomed self catering cottage which sleeps up to 5 guests. Downstairs: a double bedroom, lounge dining room kitchen and bathroom. Upstairs: a loft bedroom for 2 - 3 single beds. Children over the age of 3 are treated as adults. 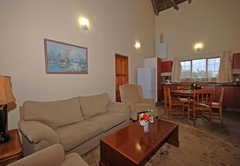 A fully equipped self-catering cottage. 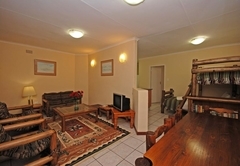 Can be let with Piet-my-vrou as a 12 sleeper unit or on its own. Downstairs: a double bedroom dining room kitchen and bathroom. Upstairs: a bedroom loft area with 3-4 single beds. Children over 3 are treated as adults. This is a lovely garden cottage on premises next door to lodge with 1 bedroom and en-suite bathroom. 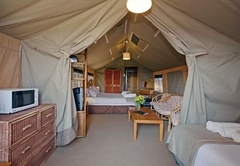 Also has 2 adult size bunk beds, a large kitchen, dining and lounge area. Best suited to a family of 2 adults and 2 kids. Children over 3 are treated as adults. 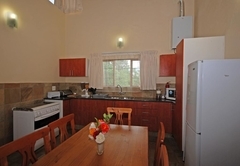 A fully equipped self-catering cottage. 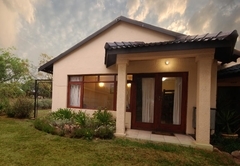 Can be let with Bokmakierie as a 12 sleeper unit or on its own. Downstairs: a double bedroom dining room kitchen and bathroom. Upstairs: a bedroom loft area with 3-4 single beds. Children over 3 are treated as adults. 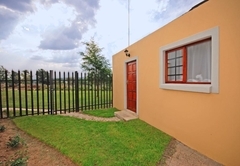 This is a lovely, small, budget, pet-friendly cottage on our own premises, right next door to the lodge. It is absolutely ideal for a single person, or a couple with or without pets. 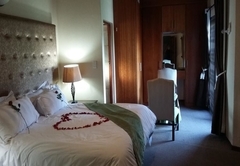 It consists of a bedroom with a double bed, lounge area, kitchenette. 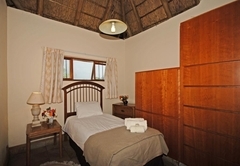 This is a small, one-bedroomed, self-catering cottage with a double bedroom, bathroom (shower only), open plan lounge with a full kitchen. 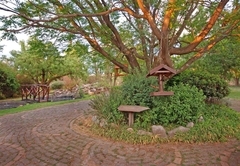 It is situated at the back of the lodge premises. It has its own garden and a really great view. 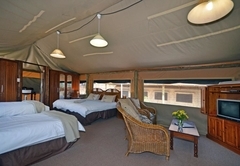 A huge luxury tent with full tiled bathroom, huge open plan carpeted sleeping area/lounge and separate dining area, fully equipped kitchen and patio. Children over 3 are treated as adults. 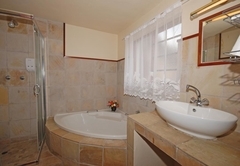 A luxury, en-suite, double room with spa bath. 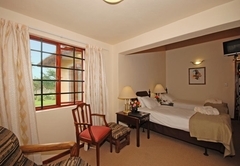 A double room with a nice en-suite bathroom with bath and shower. 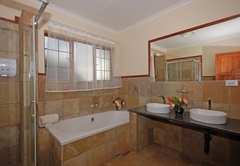 A double room with en-suite bathroom. 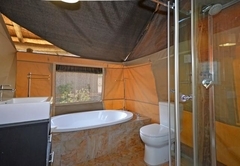 A double room and a single room upstairs, sharing a separate, luxury, private bathroom. 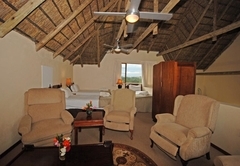 9 Reviews from SA-Venues.com travellers. All reviews are verified. Absolutley beautiful accomodation, central to where we needed to go and easy to locate using the GPS. The couple who run this were delightful. We stayed in the guest house, very comfortable and self contained which was nice. Would have been perfect if the Breakfast part had been up and running but am assured its coming! I brought a group of 17 students from the UK to spend the a week in Johannesburg and the surrounds and get the full South African experience. I can not rate the lodge and the staff anything below excellent! We felt like we were visiting family, and the atmosphere and the surrounds made for a calm and beautiful envionment. 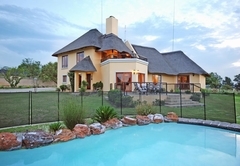 Located perfectly to straddle sights in and around Gauteng and further afield towards the Magaliesburg area. Everyone was warm, accommodating and friendly and the facilities and breakfast are superb! Thank you to everyone for the making my students' first trip to South Africa a truly wonderful South African experience! Response timeHoopoe Haven Guest House typically responds to requests in 5-10 minutes. 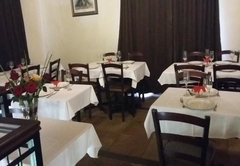 If arriving after 17h00 contact us to make arrangements.